Definition at line 33 of file utils.h. Definition at line 268 of file utils.h. Definition at line 265 of file utils.h. Definition at line 266 of file utils.h. Definition at line 264 of file utils.h. Definition at line 260 of file utils.h. Definition at line 267 of file utils.h. Definition at line 263 of file utils.h. Definition at line 261 of file utils.h. Definition at line 269 of file utils.h. Definition at line 262 of file utils.h. Definition at line 293 of file utils.h. Definition at line 287 of file utils.h. Definition at line 246 of file utils.h. Definition at line 247 of file utils.h. Definition at line 232 of file utils.h. Definition at line 233 of file utils.h. Definition at line 306 of file utils.h. Definition at line 231 of file utils.h. Definition at line 305 of file utils.h. Definition at line 286 of file utils.h. Definition at line 285 of file utils.h. Definition at line 84 of file utils.h. 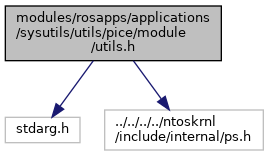 Definition at line 92 of file utils.h. Definition at line 288 of file utils.h. Definition at line 36 of file utils.h. Definition at line 705 of file disassembler.c. Referenced by COMMAND_PROTOTYPE(), InstallSWBreakpoint(), TryToInstallVirtualSWBreakpoints(), UnassembleOneLineDown(), UnassembleOneLineUp(), UnassembleOnePageDown(), and UnassembleOnePageUp(). Definition at line 300 of file utils.h. Referenced by COMMAND_PROTOTYPE(), HandlePageFault(), and InitPICE(). Definition at line 301 of file utils.h. Referenced by COMMAND_PROTOTYPE(), and InitPICE().